One of our goals for the enhanced Beamblog is to offer more behind-the-scenes peeks at what goes on in the Beamdog offices. In March we had a post about our art process and how new areas are added to the game. We'd like to do similar posts on scene writing, story creation, and technical processes. Today, though, we're going to talk about something a bit more fun. Recently we started an in-office Dungeons & Dragons game using the new rules from Wizards of the Coast. Our weekly sessions have carried us from the Dalelands to Cormyr, cutting down orcs along the way. Campaign design is similar to game story design, so today we'll take a look at the care and feeding of a D&D campaign! Amber Scott here, known as the Beam Bard to some (for my incessant singing and fancy hat). I'm a writer at Beamdog and also the office Dungeon Master. 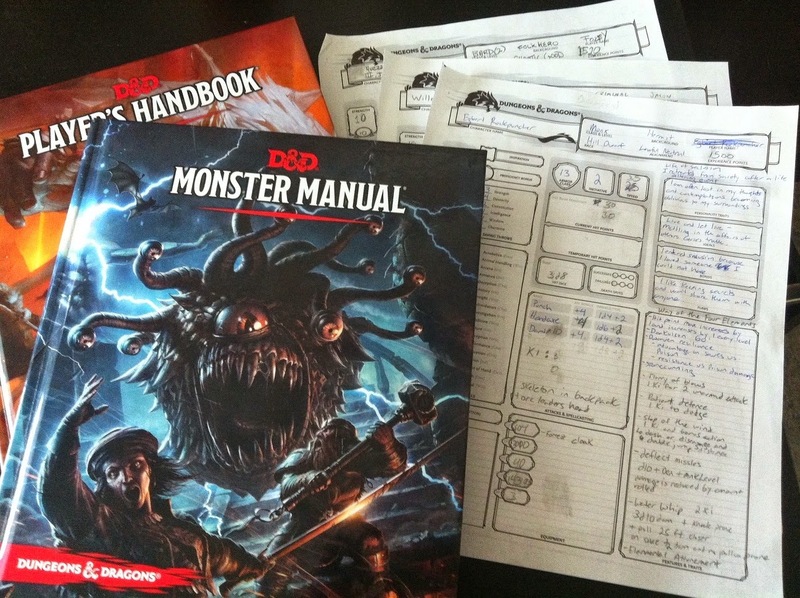 Late last year, I proposed to the higher-ups that we start an office D&D game so that we could learn the new edition rules and prepare ourselves for future projects that might (might!) take us in that direction. When we came back from holidays in January, I started preparing a homebrew game for the crew. Wizards of the Coast publishes their own adventures, of course, and Hoard of the Dragon Queen was getting good reviews. I decided to make my own campaign for a couple of reasons. Size. Unlike most games that I've run, we had a lot of players. I mean a LOT. At one point we had nine people playing at once. Everyone in the office wants or needs a seat at the table, because this is to learn the rules as much as to have fun. We rotate players regularly so that everyone gets a turn. With such a large group, I'd have to adjust most of the encounters in a published module anyway. Time. I made a business case for running the D&D game and it does bring value to the company. However, we still have a lot of other work to do. Therefore we only play for 2 hours on Fridays. At that rate (especially with a big group) it would take forever to get through a conventional module. Fun. I love writing. It's why I'm a writer, naturally. So I was excited to craft my own storyline in the Forgotten Realms using the new edition rules. I began to develop the outline by choosing a region. The Sword Coast held a natural draw, but I didn't want to tread too-familiar territory. Some of my favorite locations, like Mulhorand and Halruaa, were much much different than what my players (some of who had never played a tabletop RPG before) were used to. I settled on Cormyr, a nation similar to ones found in the Sword Coast. It would be familiar to my players but still hold some surprises (like when Phil thought the Purple Dragons were actually purple dragons). Next I decided on an overarching story to tell. I normally don't know all the details of a campaign before I start. I like to use what the players do to shape the later parts of a story. But I like having a little structure to guide the early stages of the game, so I chose to make the campaign an “against the orcs” story. Orcs are a classic D&D foe and I thought the players could easily get into such a straightforward storyline (although I'd throw in some plot twists along the way). I told the players they were heading to Cormyr because orcs and bandits had been raiding out of the King's Forest and a bounty had been offered. The PCs would begin in the Dalelands and cross the Thunder Peaks to reach the town of Arabel. We'll soon have some more characters, as a few people want to join in. We have a lot of remote employees and recently one (Five-Eyes) has joined the game by Skype. It worked out a lot better than we thought it would. The next step was to write the first adventure. When I design adventures, I tend to come up with an image, a scene, or a battle that captures my imagination, and then I build the rest of the adventure around it. In this case as I imagined the PCs travelling over the Thunder Peaks, I imagined them being caught in a terrible storm and coming across an old hunting lodge for shelter. That led to the first session, where the PCs explored the lodge and boarded themselves up against the storm, and were later set upon by rival mercenaries also heading to the King's Forest (and looking to take out the competition). The journey to Arabel was easy to plan; I designed some bandit encounters as well as fights with other creatures to avoid monotony, and added some roleplaying encounters with merchants and with an unfortunate soul who'd tumbled off a cliff and was lying unconscious on a ledge. Once the party reached Arabel, I had to develop the central storyline. Orcs and bandits were attacking—but why? I started to brainstorm ideas and that's when I came up with something involving the orc god of plagues and disease, Yurtrus. Recaps of the session can be found on our forums. Next week I'll talk about the central villain of this campaign arc and how I designed the challenges the PCs now face. Spoilers will abound, so players—stay away! The rest of you, though, come back next Tuesday to learn more about the cult of Yurtrus and their mysterious leader, Urmgech...and what his dastardly plan entails. Or tune in to our Twitch stream on Friday, 2 pm MDT, to watch the game LIVE! Mostly it's me looking frazzled while the players jam severed orc heads on to dwarf skeletons, but maybe that's your thing. Oh, and come back tomorrow for the final post celebrating the enhanced Beamblog!